You and thousands of Indivisibles are making the difference. A new Congress better reflects what America looks like. Many elected leaders share our values, even at the local level. 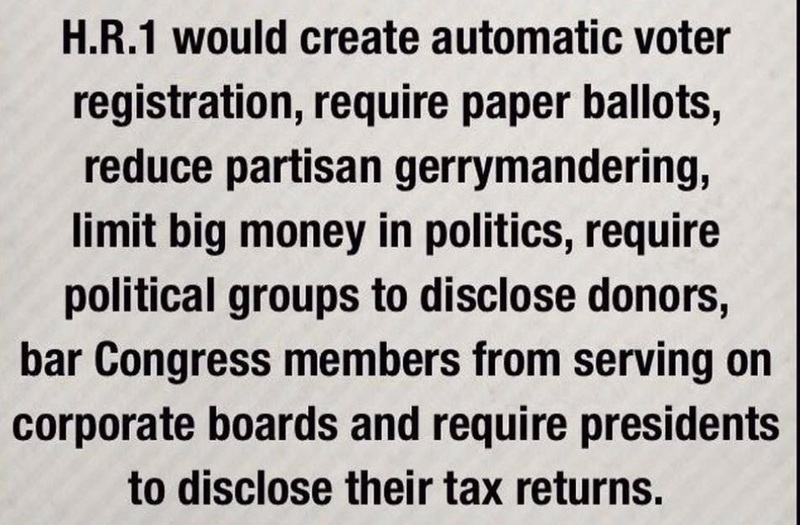 More Americans actively defend democracy. Celebrate with us on Saturday at the INCO summit - and enjoy a day of hope, mutual support, and good company! * INCO's Advocacy Team is fielding requests for your organization's literature to be available here.. Contact incoregon@gmail.com. An optional box lunch can be purchased in the morning, with sign-making and postcarding available during lunch in the showroom. We'll walk less than a mile on downtown sidewalks. This inclusive, nonviolent event is free and open to the public. 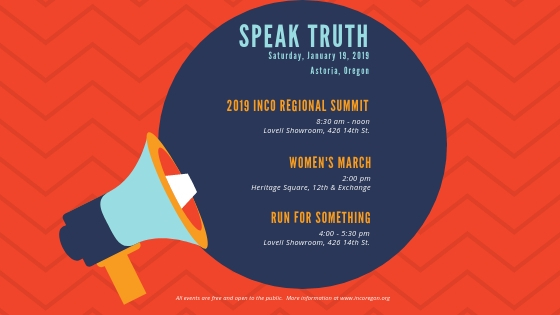 This march is posted on national sites, but INCO is not affiliated with the national organizing groups. Panelists are Bruce Jones, Mayor of Astoria; Tita Montero, Seaside City Councilor; Kathleen Sullivan, Clatsop County Commissioner; Pam Wev, Clatsop County Commissioner. SAFETY: We will walk on the sidewalk for less than a mile, mainly on Commercial and Marine Drive. Obey traffic lights and stop signs. Use common sense and courtesy. Volunteer safety monitors in neon vests will assist for everyone's safety. BE PREPARED: Do not engage with hecklers. Ignore them. In the unlikely event of a physical threat, call 911. Should press or others ask to interview you, it's OK to decline to speak. If you choose to talk, be sure to ask who is interviewing and how the material will be used. PARKING & PETS: Unlimited free street parking is widely available up the hill from Exchange Street. Two- and three-hour parking is available in many downtown locations. Pets must be on a leash. Public bathrooms are 1/2-block east of 12th on Exchange. 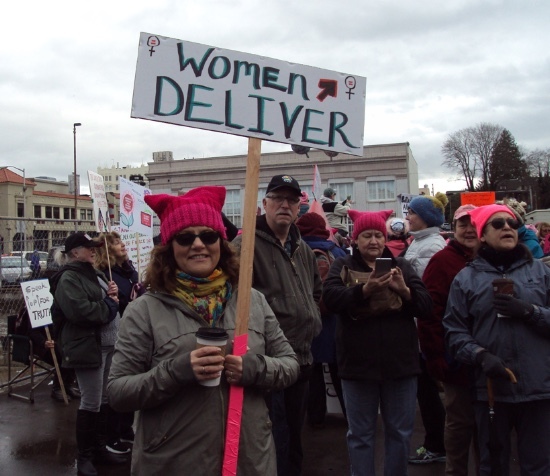 SIGNS: We encourage you to make and carry a sign with your positive message about what you believe in and what you're working for. Organizations are invited to march with their sign/banner. PHOTOS: Please post your photos on the INCO Facebook page or email them to incoregon@gmail.com. Here's Indivisible's resource guide to the shutdown as well as responding should Trump declare a national emergency. This is a great time to tell your Members of Congress to defend democracy, end the government shutdown, and support the Mueller and Congressional investigations into Trump and his administration. If only we could tackle every issue on our list! Tell us the goals and outcomes you want for INCO this year on this quick and easy survey. There are no wrong answers! Survey due by tomorrow, Tuesday, January 15. 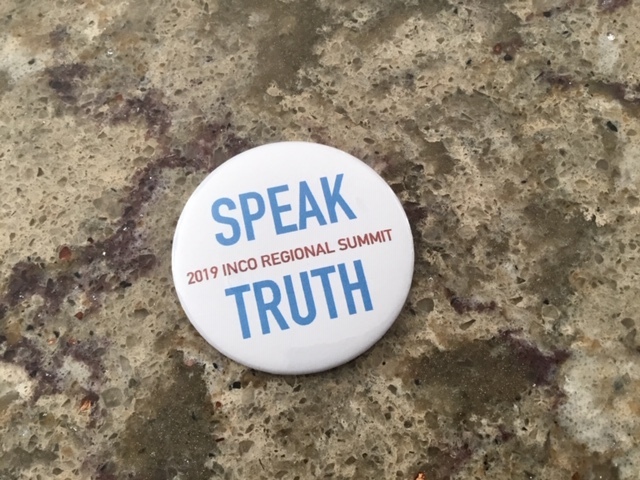 The 2018 INCO summit. Put yourself in the picture at Saturday's Speak Truth summit. Sponsored by the Astoria Film Festival. More information here. Hidden Figures is the little-known story of the Black women who worked with the space program in the 60s. Based on the nonfiction book written by Margot Lee Shetterly, this screening is in honor of Martin Luther King Day and a tribute to the African-American women who helped to build America's space program. A discussion forum will follow the screening. Thanks to Indivisibles Carolyn, David, Chris, Kathleen, Roger, and others for organizing the community events shown below. 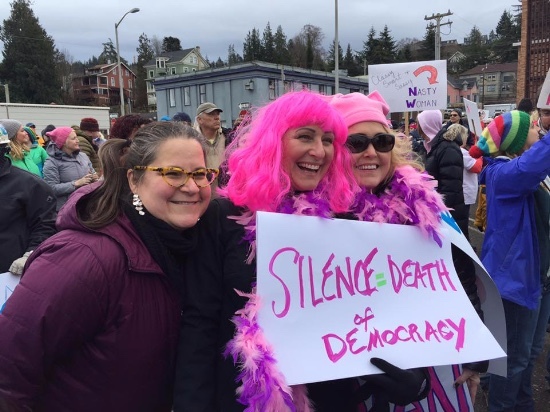 Wednesday, January 16 - INCO on 'Talk of Our Towns' radio program, KMUN -91.9 FM, 9:30-10 am, featuring Kathleen MacDonald, Seaside-Gearhart Community Group co-leader; Carmen Hammersmith, Warrenton Community Group co-leader. Saturday, February 2 - Astoria Community Group monthly meeting, 1 pm, Street 14 Cafe, 1410 Commercial Street, Astoria.